Richard G. Kyle and Dale W. Johnson, John Knox: An Introduction to His Life and Works (Eugene: Wipf & Stock, 2009). xi + 208 pages. ISBN: 978-1606080900. Review copy courtesy of Wipf and Stock. This volume, co-penned by two scholars well published on the book’s subject, traces the life and thought of John Knox. It does so not via an attempt at what we might call ‘straight biography’ but rather through a chronological examination and interpretation of his writings. The interpretation of Knox offered here is sympathetic but fair, helpfully introduces some secondary literature on Knox, avoids an over-romanticised reading of the preacher whom Stewart Lamont described as ‘a cross between Ian Paisley and the Ayatollah Khomeini’, and avoids the temptation succumbed to by many contemporaries biographers of judging too harshly the personalities of the past against the values of the present. A very accessible and (apart from some editorial oversights and typos, for e.g., an incomplete bibliography, and who is T.F. ‘Torrence’?, on p. 21) well-researched introduction to a complicated yet decisive period in Scottish history, and that via the life and thought of one of its great saints. 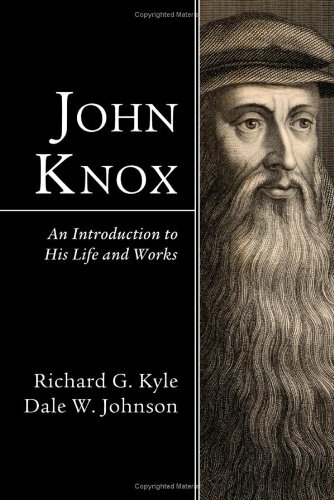 John Knox: An Introduction to His Life and Works is an easy book to commend, and those looking for a genuine entrée on the life and thought of a volcanic prophet with ‘the courage of a lion’ could do little better. Those hungry enough to also want a main course would be well served in the devouring of John Knox by Rosalind K. Marshall too. Could you please tell me what you meant by this… (apart from some editorial oversights and typos, … and who is T.F. ‘Torrence’?, on p. 21)… in your review. Thanks. Will, it’s been over a year since I read this book so I can’t recall off hand what editorial oversights I had in mind, but the reference to ‘T.F. Torrence’ should read ‘T.F. Torrance’.